Located in the foothills of the French Pre-Alps, the ITER installation blends almost seamlessly into the landscape. The architects' choice of mirror-like steel cladding for the main buildings of the installation has proved efficient—contrary to the other structures in this image, the massive ITER Assembly Hall seems to fade into its surroundings. Taken with a powerful telephoto lens, the image reveals the beauty of the snow-capped mountains, which rise some 2,000 metres at a distance of 60 kilometres. A comparison with the photograph above, taken from the very same spot one year (to the day!) 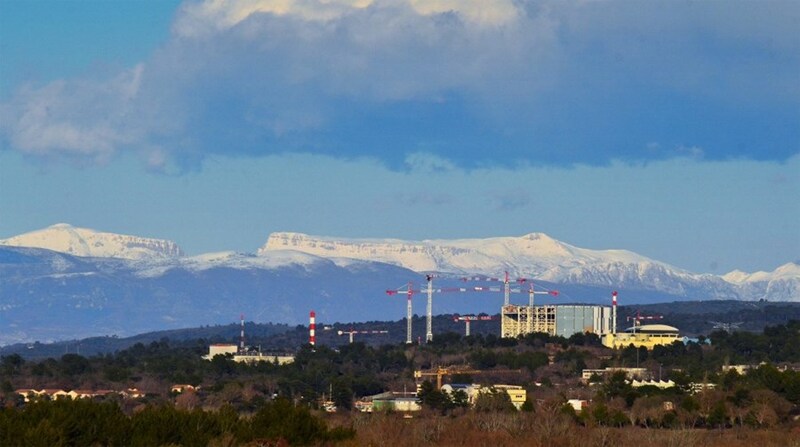 earlier, highlights the progress accomplished on the ITER site. In early March 2016, the cladding on the Assembly Hall was far from complete and the vast building was still empty. Today the main and auxiliary cranes have been installed and finishing works are underway on the building's interior, where the first large assembly tool will be erected in a six-month long operation that will begin this summer.